Farnesene Market size was estimated at over 8 kilo tons in 2015, with growth forecast set at over 27% CAGR up to 2023. Global biofuel production was estimated at over 69 kilo tons of oil equivalent in 2014. Strong focus on increasing usage in vehicles and aviation sector owing to curb CO2 emissions is a trend driving global farnesene market size. Biomass derived diesel & jet fuels may be used as drop-in and cost competitive replacement for conventional fuels. EPA has approved farnesene derived renewable diesel for blend up to 35% and it contains no sulfur or particulates. ASTM had also revised standard for renewable farnesene use as blending component with jet fuels in commercial aviation. ASTM certified biofuels have no safety problems or technical issues for flights. Renewable Energy Directive (RED) in EU has set a target of 10% renewable energy use in transportation across EU by 2020. Key relevant legislations, Fuel Quality Directive (FQD), Renewable Fuel Standard (RFS2), Commercial Aviation Alternative Fuels Initiative (CAAFI), are set up in EU to promote biofuel demand use in aviation sector. Strong application scope of squalene in moisturizing and anti-ageing creams should drive product demand. Squalene market size was estimated at above 2.8 kilo tons in 2015 and is forecast to grow over 8.8% up to 2023. Farnesene derived through biotechnology route forms building block for numerous chemicals, including squalene. Strong growth expected from the booming European cosmetics industry may drive farnesene industry demand. European cosmetics market was worth over USD 80 billion in 2014. Germany personal care & cosmetics market was the dominant in European region with total worth at about USD 14.8 billion in 2014 and was followed by France and UK with valuation estimated at about USD 12.06 billion and USD 11.7 billion in the same year. Cosmetic companies are avoiding shark liver oil based squalene and preferring ingredients derived from vegetable sources or biotechnology route for product formulations. 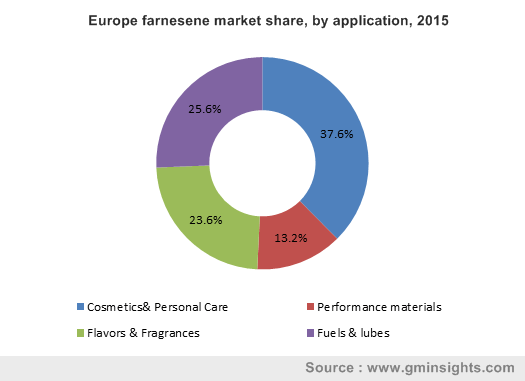 This factor may favor farnesene market growth for cosmetic applications. Sugarcane, key feedstock, used for farnesene production may be affected by unsuitable weather conditions, which can hinder growth. Also, sugarcane majorly produced in Brazil, accounts for over 55% in ethanol production followed by sugar. These are major influencing factors responsible for fluctuating farnesene market price trend. Alternative aviation biojet fuels, HEPA, FT based on biomass and HPO may challenge market growth. Aviation industry does not depend on single feedstock type are powered by various blends derived from different biomass with aviation fuel. Cosmetics & personal care application was dominant with demand valued at over USD 12 million in 2015. Farnesene market size may expand owing to increase in squalane demand. Cosmetic formulation companies may prefer to procure squalane derived from biotechnology route rather than expensive and unsustainable sources such as ultra refined oil or shark liver. Performance material applications are forecast to grow significantly at over 40% CAGR up to 2023. High-purity derived product can be used in tire manufacturing and currently being tested by companies in their formulations for performance and safety process. Polymerized farnesene can easily react with tire rubber and can attain strong adhesion of rubber components for improving performance and shape stability. Europe farnesene market size, led by Germany, UK and France, was dominant and generated over USD 15 million revenue in 2015. Strong focus on using sustainable product derived from biomass coupled with environment measures to curb GHG emissions is expected key trend to drive demand in Europe. APAC, led by China and India personal care & cosmetic industry growth, is forecast to grow significantly and attain over 28% CAGR from 2016 to 2023. Growth in per-capita disposable spending capacity coupled with presence of various large scale manufacturing companies may trigger APAC demand during the forecast period. Latin America, dominated by Brazil consumer base, expects strong gains during the forecast period. Favorable weather conditions to harvest sugarcane crops round the year in Centre-South and North-East part of the Brazil, may influence positively to instigate product demand. Sao Paulo is responsible for almost 60% of sugarcane production in Brazil. Global farnesene market share is dominated by Amyris, which uses yeast to manufacture through biotechnology route. Total, Kuraray, IFF have colaborated with Amyris to form target molecule for use in relative applications such as fuel, tire and flavors & fragcances. Chromatin and Intrexon are presently in nasecent stage for achiving commericial production level. Intrexon has achived lab scale production route via methane bioconversion whereas, Chromatin has developed sorghum plant with elevelated product level through gene stacking method.